The brand new MBTA station has the look and feel of any stop on the Blue Line: A train car idling next to a platform, the chatter of a waiting crowd, doors opening and closing, the rhythm of trains passing on the tracks. And then — BOOM. The unmistakable sound of an explosion shatters the make-believe tableau. A few beats of silence, then a crescendo of screams. Lights flicker as smoke pours out of the train and onto the platform. On Wednesday, the Massachusetts Bay Transportation Authority is set to unveil its new $10 million emergency training center, a federally funded project designed to help emergency responders learn how best to react to dire situations within the T system. The training center will officially open with a ceremony featuring John S. Pistole, head of the US Transportation Security Administration. The underground training center, about the length of three football fields, includes a Silver Line bus, a Green Line train, and a Blue Line car, all of them immobile, along with high-tech special effects devices that will allow training staff to mimic the circumstances of a tunnel fire, shooting rampage, medical emergency, or terrorist attack. And the center will not just be used by MBTA staff: Police, fire, and emergency medical response units from around the region will also use the space to train for a disaster in a subway tunnel. 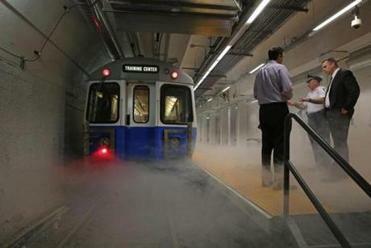 Smoke poured from a train during a fire simulation in the MBTA’s new emergency training center. Though the project has been in the works for several years, officials said the Boston Marathon bombings have underscored the need for preparedness training that closely replicates the chaos and confusion of a real-life emergency situation. The tunnel, next to Broadway Station, was built in 1917 and was used to turn around streetcars at the terminus of the Red Line. A short time later, when the Red Line was extended to Andrew Station, the tunnel became obsolete. Since then, it has mostly been empty, frequented only by graffiti artists and the homeless. After bombings on metro systems in Madrid and London a decade ago, T officials became increasingly aware of the need to train for emergency situations on trains and buses. In 2011, McMillan said, funding from the Department of Homeland Security made the project possible. In the past, training for emergency responders could only take place in tunnels in the wee hours of a Sunday morning, before the system got up and running for passengers. The new facilities will allow for more scheduling flexibility. They will also be available for nonemergency uses: People with disabilities seeking to start riding the T will be brought into the center to learn how to board and ride the train. The underground training center has a replica Blue Line platform, a Green Line station, and a Silver Line tunnel. Operators on the train can open doors, ring bells, and make announcements just as they can in a regular train. A sound system hooked up to all the cars and platforms plays a range of ambient noises: the din of chatting passengers, the clunk-cla-clunk of a passing train, the beep that announces a set of closing doors. “Outside of someone playing guitar by a Dunkin’ Donuts, this is an MBTA station,” Clarke said. The sound system also plays the sound of explosions, gunshots, and screams. Each of the cars has smoke machines and surveillance cameras, connected to a command center where supervisors can watch the emergency response unfold on computer screens and from behind one-way mirrors. In an adjacent classroom, trainees can review their performance on smart boards. “It’s kind of like we’ve turned it into Disneyland for first responders,” Clarke said. Follow her on Twitter @martinepowers.